I must be the only blogger alive who's never done any giveaways but now I have a perfect reason: I am clearing my shelves before a big move to London in a couple of months' time. Yes, it's scary, yes, it's exciting, yes, it's sad and yes, it's full of uncertainty. I am not sure whether I'll like London, not sure whether I'll stay with my company, not sure where I can buy a new sewing machine (because the old one will have to find a new owner). But this post is not about that: it's all about the giveaway. My shelves are full of Japanese sewing and craft books, but I won't be taking some of them with me. Hopefully, five of you will be lucky and end up with one of the sewing books! 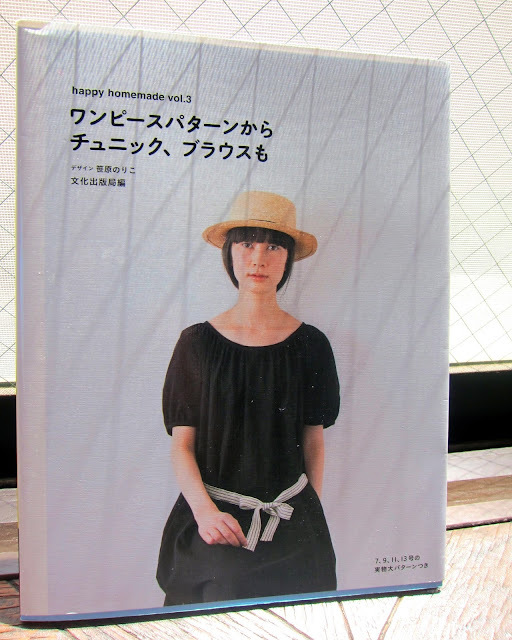 This giveaway will be running between my blog and Japanese Sewing Books, whose owner Yi Farn kindly agreed to share it. If you already own a Japanese sewing book, you can find a lot of useful information on her blog, for example, how to understand Japanese patterns or dictionary of Japanese sewing terms. NOTE: some of the books are brand new but some have been used to draw patterns! The conditions are simple: just leave a comment about anything that crosses your mind - the state of international affairs, the book you are currently reading, today's weather forecast or your current sewing project. At the end of each giveaway period (there will be five, schedule included at the very end of this post), Yi Farn and I will draw one winner from those who have commented on either blog (maximum two entries per person, for leaving a comment on each blog). Giveaway #1 offers this Happy Homemade vol.3., brand new book. For more pictures you are welcome to visit Amazon and check the preview. I've also just found this Flickr photostream, please check it out. The giveaway will close on Friday May 3rd, at 23:59 Japanese time. The winner and the next book to be given away will be announced on Saturday, May 4th. London is a great city, with amazing fabric shops. At the very least you'll get a great sewing machine in John Lewis. But, dependent on which part of the city you'll be living in, I'll lay money on you finding a great sewing machine store. I lived in Surrey for several years and commuted into London for work. I wish you much luck...and although I don't live there any more, do shout if there is anything I can do to help/advise. Oh wow! I would love one of those! And already a big welcome to Europe. London is Great! OMG! You're moving to London! How exciting! My thoughts for today are that I would like to try and make some more chocolate chip and salty popcorn biscuits. They were tasty! What an exciting move! :) At least it'll be easy to make friends, what with all of those sewing meetups all the time! For what it's worth, I mailed my sewing machine to Canada through Japan post for about 10 000yen, and it arrive just fine! Mine be cheaper than buying a new one, if you like your current machine! I am sure there will be plenty of meet-ups, bake-offs and sew-alongs ;) Not sure about mailing my sewing machine all the way across the ocean. I had a bad experience with the previous one when shipping it from Dublin to Tokyo. It broke during the shipment. WOW, whereabouts you are moving? Hmmm never tried chocolate chips and salty popcorn biscuits. Do you ming sharing the recipe? Thanks a lot! I am sure I'll have lots of sewing-related questions once the move is done. Oh wow! Will it be closer to your family? More importantly, will you still have your little Etsy store!? I've already got this book, so don't include me on this giveaway, although you know I love a Japanese pattern book so will be standing by for the next giveaway! I love japanese sewing books for their simple timeless classic designs and clean lines and also tho wonderful fabric suggestions ! Wouldn't mind adding one more to my japanese sewing book collection. Winning giveaways is not my thing, sofar have won only once, fingers crossed! I didn´t know your blog. It´s a good way to sew for myself as i just have children patterns. Thanks for the giveaway! I need to start sewing my stash. Nice blog. Nice blog. Would love the book. I would love to win a Japanese sewing book! I'm itching to do some spring sewing. I'm pregnant and I think that many of the styles in this book would get me through the first couple of trimesters! I have some clothes that is just sitting there waiting to be turned into beautiful dresses. I am envious that you are starting a new adventure. I love where I am, but there is something exhilarating about a big move and unknowns. The preparation and packing will be the hard part. Best of luck to you and best of luck to me to win one of your wonderful Japanese sewing books! Hi there. Good luck with the move. It's a gorgeous spring day here in Cambridge, MA. I'm ready for some springtime sewing! At the moment I am sewing a petticoat out of tulle - the tulle is so fiddly to work with because the cut edges stick to each other and to other things! But it's coming along well. Thanks for hosting this giveaway! Yay to the spring weather! I hope you'll enjoy living in London; I was there only once for a short visit and loved it. Thank you for the giveaway! You are right too get back to your sewing machine! The patterns from Japanese sewing books are super easy to start with! Would love to win this book. I think you will love London! Good luck on your move. I'm sure you'll love London, especially if you have any interest in theatre. Best in the world :) Check out the sewing forum online at Artisan's Square. Ann Rowly, is (or was) competing in a reality show to find Britain's best seamstress/seamster. (I'm in Canada so I don't get the show but I did manage to find a couple of episodes on YT.) Lots of sewing in London! For your first giveawy this is a pretty wonderful one! I am waiting for nani iro fabric in the mail and I would love to use the book for that! Good luck for your move, I hope London will welcome you warmly. Greetings from Germany! i hope your move is not too complicated and you find a nice area of London to live in, it is a wonderful city but i am a country girl at heart i like a quieter way of life. sewing is about to become the next big interest in the uk as the programme referred to below has been aired with great success. The Great British Sewing Bee if you want to look it up online or i think it is on youtube already. it was very interesting and super inspiring to keep us all sewing!!!! good luck with everything i could cry for you that you have to give away your books and sewing machine. It's a beautiful spring day here, my newly planted apple trees are getting their first leaves. I been going crazy with gardening fever and looking forward to when everything is planted and I can slow down & sit in the yard to do some hand sewing with my resident humming birds flitting around my head! Today was a great day, I have the time to sew all I wanted ;) a top from a spanish sew along!!! I would be the happiest Lady on earth if I am selected as one of the winners because I still have a long way to go as regards my sewing skills. This will also enable me move forward in my vision of running a fashion school for those that do not have financial means to go to a formal school but still want to be useful to the society which will go a long way to alleviate the suffering of the less priviledged. I love that you're having these giveaways, I would one! much luck on your move. i love japanese sewing books. and even though i am also in a the middle of a move i would love to have one! I wish I were moving to London! Thanks for sharing what you can not take with! Thanks, Ramona! Even when I give away my five books, I still have lots :) Good luck! Just found your blog through the giveaway on Yi Farn's. Thanks for sharing the wealth of knowledge! I'm now following your blog too! Thank you, Moushka! I do love theatre and ballet (which is scarce here in Japan). So really looking forward to amore vibrant cultural life there! And making more fancy dresses! Aww, lucky you! I wish I had a little garder too! Hi, I found your blog thanks to Yifarn's post about this giveaway. Like this book very much! Thanks to both of you for the great giveaway! Wish you all the best in London. hi thewallinna! I'm from Indonesia, I saw many sewing books from Japan at book store, but it's too expensive for me :( so I just read that cute books at the book store. I just blog walking from japanesesewingbooks.com and lost here, but I really love this blog and now following you! I hope can get this book for my first Japan sewing book and I love to learn it! Btw, this is my newest wallet, handmade by me :D Obviously, you'll love London, cause sewing made your day! Thank for the opportunity and wish I can win this thing! i found this japanese fabric on a website in america but the postage is astronomical!! https://www.superbuzzy.com/shop/product/butterfly-flutter-blue/ i was wondering as i sourced the books from japan wether i could find this fabric there too maybe the postage would be cheaper? do you know of any good websites in english that i could find this sort of fabric on. there dosent seem to be any in UK that stock this type of thing? Count me in for the giveaway, please! I don't have any Japanese sewing book, so I would really love one! I'm in love with the simplicity of the Japanese clothing style and this book looks amazing. I wish you a happy move to London, which is a great city! Thanks for this giveaway! I have a stack of Japanese sewing books but I can always use another! My long term plan is to have a wardrobe completely sewn by me. So some variety in style is most welcome! i want to win this... that's the first thing i thought... well... who didn't??? this website dailly and obtain nice data from here all the time. Excellent goods from you, man. I've understand your stuff previous to and you are just too wonderful. I actually like what you have acquired here, really like what you are saying and the way in which you say it. You make it entertaining and you still care for to keep it sensible. I can not wait to read much more from you. This is actually a terrific site. site as a finest website for hottest updates. What is the real secret of Chanel jackets?